After years of letting its windows do the talking, Woolworth UK finally appointed a Marketing Director in October 1970. Mike (L.B.) Sherlock had risen through the ranks, managing a number of stores, before proving himself as a Buyer and taking up the appointment. He soon proved his worth in the role. His Wonder of Woolworth campaign turned around the retailer's dire trading results in turbulent times. His Public Relations work, developed hand-in-glove with MD Geoffrey Rodgers and the Chairman, Stephen J. Owen, proved equally effective, but the results were not at all what had been planned. The impact in future years would be massive. The PR targeted City Editors, but hit home with a suitor who went on to buy the business and make more changes in seven years than it had faced in the previous seventy. By the 1970s some of Woolworth's traditions looked outdated. The chain had not kept pace with rapid changes in marketplace working practices. For example at a time when people had started switching jobs in mid career, the retailer continued to fill virtually every role internally. The Board Executives had all started their careers in the stores, or occasionally as trainee accountants. Even when the law finally forced the appointment of Non-Executives later in the decade, the Company circumvented the intention by co-opting trusted, long-serving advisers who knew Woolworth's inside-out. The Executive Directors had all trained in a cash-rich company that had grown exponentially over the years by opening additional stores, and extending branches that were already trading. But, by 1970, saturation point had been reached in the British Isles. The main expansion initiatives had stalled. Despite spectacular sales, Woolco had found it difficult to persuade planners and local authorities to grant permission for new out-of-town openings and was facing in-fighting between its Buyers and their counterparts from Woolworth's. Meanwhile Ian Smith's Unilateral Declaration of Independence and the resulting sanctions from the British Government had undermined its multi-million pound investment in an overseas subsidiary in Rhodesia (Zimbabwe). Reserve funds had been depleted by decimalisation and conversions to self-service operation. For the first time the Woolworth Board would have to engage with the world outside. It would have to raise money in the City for investment, sell underperforming stores, drive efficiencies despite an ever-increasing level of union membership among its staff, and face a new generation of leaner, meaner competitors head-on. They would have to do this against a background of industrial unrest in the country at large, rapidly rising price inflation, compounded by unforced internal errors, particularly the loss of its main distribution depot and its reserve stock in a major fire. 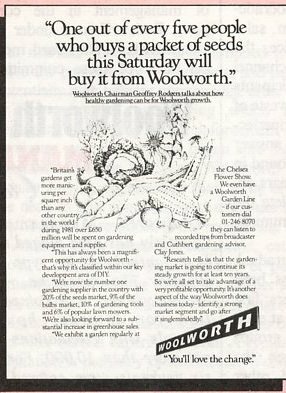 As well as driving increased customer traffic into the stores, the chain's first Marketing Director, Mike Sherlock, would need to win over the hearts and minds of staff and investors to a new strategy and convince them that Woolworth was a modern, dynamic retailer with big plans which would improve the brand's fortunes and take it back to the top of the market. Sherlock guided the Board to some good choices, selecting Peter Marsh's up-and-coming advertising agency Allen, Brady and Marsh as a key partner. ABM's services included brand identity, advertising and public relations. 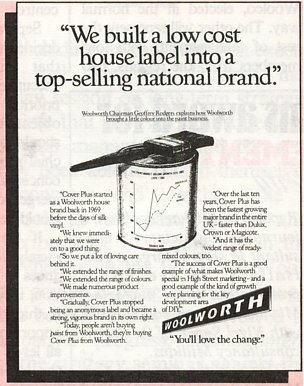 Rod Allen coined the slogan 'The Wonder of Woolworth' with a catchy jingle, even persuading a sceptical Board to accept the words 'good old Woolies'. Meanwhile Peter Marsh worked on corporate identity, advising on everything from uniforms to shopfittings, with a remit that included investor relations. He proposed to use Sponsorship and good works to engage with the City and with investors at large. 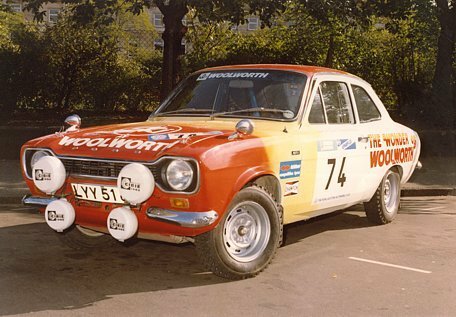 The Woolworth name went on to appear on rally cars that won races, a tall ship that set a Transatlantic world record in 1976, special London Buses marking the Silver Jubilee of H.M. Queen Elizabeth II, and at the Royal Tournament. Even a former Prime Minister picked up the baton, Edward Heath PC MP, became guest conductor at the Woolworth European Young Musician of the Year contest. 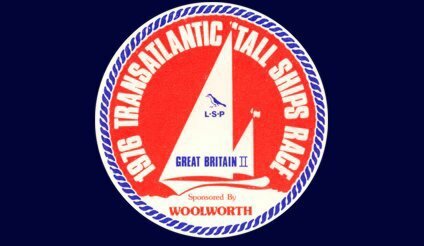 ABM hoped such sponsorship deals would make the public see the Woolworth name in a positive light, and would boost the staff's pride in the brand. It was a gamble. Had Great Britain II sunk into oblivion the brand might have gone with it, but winning the race was beyond even the Agency's dreams. To improve recall of the Winfield own-brand, an example range was placed on a pedestal and advertised wall-to-wall. 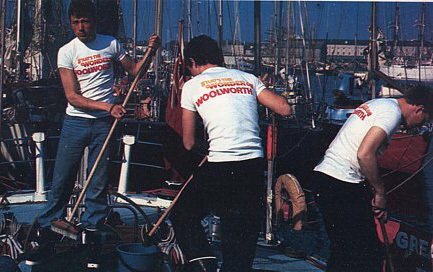 Woolworth chose to 'tackle' fishing. ABM devised a campaign code-named 'hook, line and sinker'. It included press advertising and sponsorship of the Angling Village at the Earls Court Boat Show. 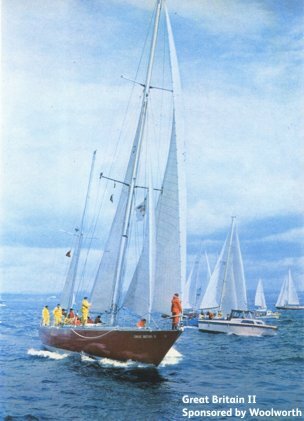 Woolworth also commissioned a book by the popular fisherman Mike Pritchard, which would be an exclusive. The author agreed, pursuading them to build 'The Winfield Lagoon' at the Pierrepoint National Water Sports Centre. 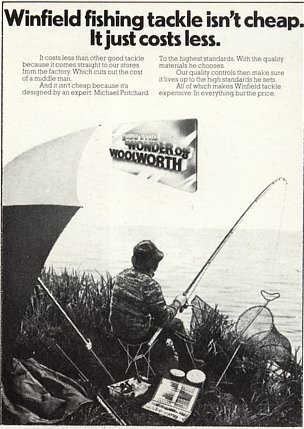 By 1980 the campaign had secured a dominant 50% share of UK angling sales ... and had forever linked the Winfield name with worms ! 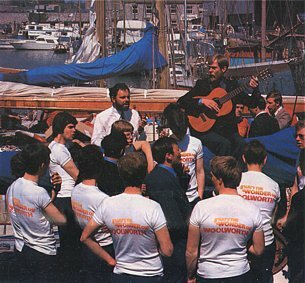 Similar techniques were used to promote Woolworth's growing range of budget clothing. As well as fashion shows and traditional print advertising, public relations experts placed stories in national newspapers. 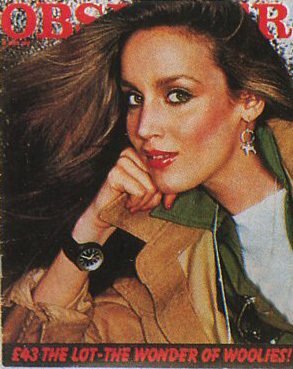 These featured whole outfits, including accessories like ear-rings and watches, with editorial that highlighted the exceptional value for money of the red-front store range. ABM were particularly proud to secure the front cover of the prestigious Observer Colour Supplement. To promote Woolworth's growing range of budget classical music, the firm sponsored the European Community Youth Orchestra, which included no less than forty young British Musicians. Former Prime Minister, the Right Hon. 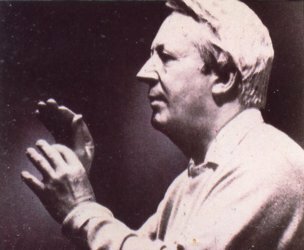 Edward Heath, PC MP, was enrolled as guest conductor to complement Claudio Abbado. 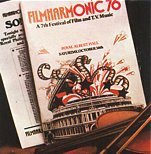 Woolworth also sponsored Filmharmonic '76 which celebrated music from the movies, backed by albums for sale in the stores. In-store there were also exclusive LPs from a number of popular artists including Andy Williams and Johnny Matthis. The salvo of advertising and public relations, alongside the award-winning Wonder of Woolworth TV campaign, brought substantial increases in traffic to the stores and generated much-needed sales. Some City Analysts baulked at the costs and highlighted emerging competition from rival retailers, with campaigns like "Oo oo oo get some oo from Boots", which they claimed would soon gobble up the gains. Despite their pessimism, in the final assessment the increase in customer numbers was sustained and the campaigns paid for themselves many times over. Bravely, Peter Marsh challenged Executives to update the Board structure, bringing in a new voice from outside. He secured grudging approval. They spent two years grooming Mrs. Pat Downs (right) before revealing their "first female executive." To be safe, they had already apologised internally for bringing in a stranger, promising that the new Director was house-trained and "competent". The next baby step was to appoint a Non-Executive Director. This was a new legal requirement. A former, long-serving external auditor was co-opted. Again there were internal apologies, noting that the new man had a comprehensive knowledge of Woolworth built over many years' service to the Company, albeit not in-store. 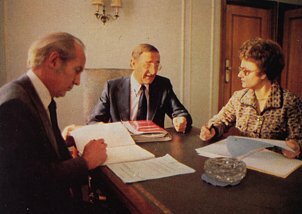 In 1980 a new Joint Managing Director, Geoffrey Rodgers, (pictured above, centre) sought to reassure investors who had been shaken by news of the tragedy at the firm's Manchester store. He fronted a new series of television commercials personally, promoting 'Operation Crackdown', a programme of deep price cuts, which was in marked contrast to Woolworth's general move up-market. The supremo also decided to explain the firm's strategy and strengths in a series of press advertisements in the broadsheet newspapers that were most popular with company investors and city analysts. 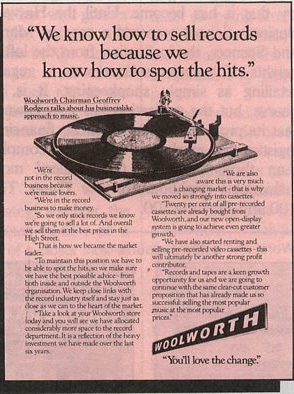 Each advert, which ran in The Times and The Financial Times, focused on a single area of the operation like DIY, Fashion or Records and Tapes, and argued that Woolworth was reinventing the variety store. The campaign had an unplanned side-effect. Some believe that it highlighted the break-up value of the organisation and attracted the surprise takeover bid which led to a change of ownership in 1982. After ignoring the world outside for seventy three years, all but one of the Board was swept aside, as the High Street chain prepared for a rude awakening! The PR showcased the brand's strengths, but the Board seemed inept. Investors saw much higher returns after the business was taken over in 1982 and overhauled more radically. The staff soon had to face new commercial realities. The sprawling City Centre stores started to vanish from the High Street, as the management discovered the meaning of terms like 'market rental' and 'return on capital employed'.